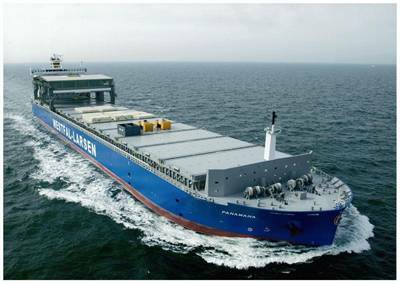 Singapore’s shipping company Masterbulk has installed UltraBattery (UB) battery pack on its large general cargo ship MV Panamana. The battery pack, manufactured by the Furukawa Battery Company, will form part of an Aquarius Marine Solar Power solution developed by technology company Eco Marine Power and it will be evaluated jointly with Masterbulk and ZEABORN Ship Management (Singapore) Pte. Ltd. The battery pack comprises of class-approved UB-50-12 Valve Regulated Lead Acid (VRLA) batteries and marine-grade battery frame kit, and it was installed by the ship’s technical team with only remote support being required. As explained by Eco Marine Power, UB-50-12 VRLA batteries are the ideal solution for smart grid, wind power and solar power applications. They have been described as safe, recyclable and long-lasting. “These hybrid batteries incorporate unique ultracapacitor technology and along with the larger capacity UB-1000, are suitable for use on ships, offshore platforms and land-based applications,” the company said. Yasuhiro Kodaka, General Manager of International Sales at Furukawa Battery added that the long-life batteries offer a cost effective alternative to lithium-ion type batteries and are also relatively easier to install and maintain. “At the core of Masterbulk’s corporate sustainability policy is a focus on protecting the planet and exploring the use of renewable energy on our ships, as part of our strategy to further reduce emissions and fuel consumption,” Lars Modin, Chief Executive Officer at Masterbulk said. The Singapore-flagged open hatch gantry crane vessel, built in 2010, is employed within the Saga Welco pool, a joint venture between Saga Ship Holding and Masterbulk. Renewable energy projects are gaining momentum in the shipping industry as owners look to cut their carbon footprint and bring about a more sustainable future for the shipping industry in line with the industry’s commitment to halve greenhouse gas emissions in order to tackle climate change. To that end, earlier this month, the world’s largest shipping company Maersk said that it aims to become a carbon neutral company by 2050. However, in order to achieve this goal, carbon neutral vessels must be commercially viable by 2030, and an acceleration in new innovations and adaption of new technology is required.